Just a brief newsletter to keep us connected and provide information on the local and international groundwater scene. My focus is rather “Cape Town–Western Cape–centric” and in future newsletter I will obtain input from other IAH members in other parts of the country for a more balanced perspective. The limited water in the Cape Town supply dams is for us a major concern, especially as the days get longer and warmer as we move into our dry summer. It’s estimated that the Cape Town supply will run out in March 2018. (Day Zero). There is more coverage now of storing drinking water and of the likely civil unrest that is anticipated to occur. We are already seeing economic impacts with some industries closing, the agricultural sector scaling back and job losses are starting to occur. From the groundwater perspective the Cape Flats Aquifer; Table Mountain Group Aquifer and other high yielding aquifers (yes, the Malmesbury Group is also an excellent aquifer in places) are not being tapped into yet to contribute to the Cape Town Supply. Many drillers have moved into the Western Cape – not yet to address the big problem – that should happen soon. Interestingly there is still a lot of drilling for wealthy private home-owners to ensure gardens stay green and for owners to move off the “grid”. Urgent action is required to secure and mobilize drillers to ensure Cape Town’s supply continues in a conjunctive manner (including reclamation from waste water treatment works, and desalination). With the urgency and pace at which borehole drilling is now occurring so many short cuts are being taken: – vast amounts of money being spent on drilling totally illogical sites selected by water diviners; boreholes being equipped based on drilling airlift yields; water treatment plants being ordered based on water samples taken whilst drilling; and the by passing of legal processes. We have an important role to play promoting a scientific approach to groundwater exploration, development, monitoring, management and authorisation. The Department of Water and Sanitation have a huge role to play in expediting groundwater use. Isn’t now the time to start accessing the Subterranean Government Water Central Areas -even if it’s on a temporary basis? We look forward to the 15th Biennial Groundwater Conference to held at Spier, Stellenbosch happening from the 14th – 18th October. The timing and location is perfect and hopefully will be well attended by authorities and regulators to become aware and get a sense and direction of the large scientific resources we have for addressing all aspects of groundwater supply. The IAH Congress held recently in Dubrovnik, Croatia (25th to 29th September 2017) was hugely successful. It was a stunning setting; extremely well organised; there were excellent presentations; and a lot of networking opportunities. The Congress has a high standard as many well-funded research projects are presented. Many South Africans attended the Congress (see photo) and it was pleasing and with pride to see how well we did at the Congress. Importantly, after the very positive feedback I received from my quick survey, and from many offers to assist, I put in a bid to host the IAH Congress in 2021. The Congress is the annual IAH flagship event. The plan is to host it as the Cape Town Convention Centre and it would also be combined with the GWD Bi-annual Conference. A main objective is to attract as many hydrogeologists from our neighbouring countries as possible. The IAH Executive Council received the bid positively and Kornelius Riemann and I met later with and were “interviewed” by the Executive Council. Prof Bruce Misstear (IAH Executive Secretary) will provide more feedback at the GWD Conference which he will be attending. 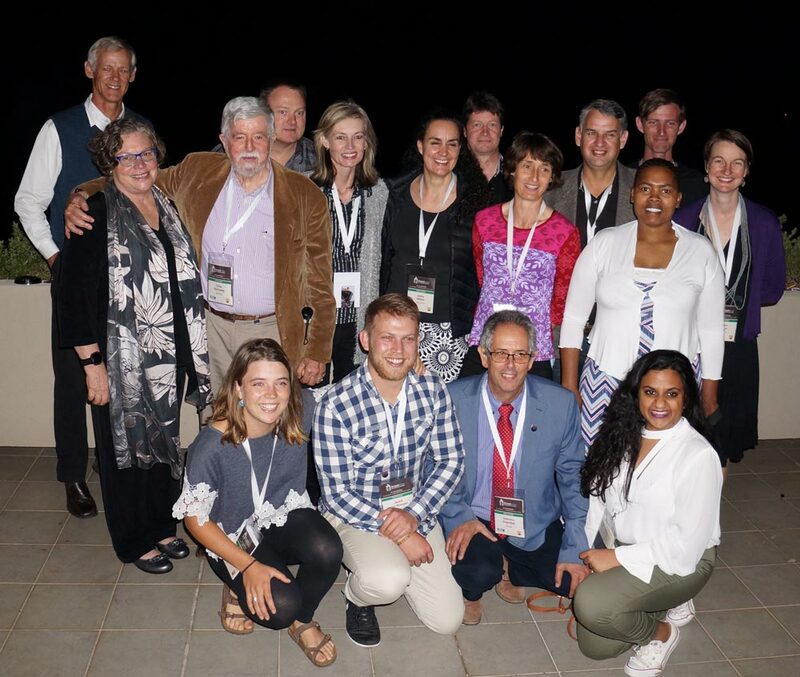 At the IAH Congress, Kornelius and I also attended the National Chapters meeting (there are 40 National Chapters throughout the world) and we had an excellent meeting. Many, National Chapters also struggle a bit with their role if “groundwater societies” already exist. I will be sending out a survey a little later in this regard. I also realised how many countries have large and very active groundwater departments within the National Geological Surveys. Having no Directorate of Geohydrology within DWS and very few geohydrologists within our Council for Geoscience is a serious shortfall and is needs to be rectified. How can we change this? The IAH-SA website received positive feedback (iah.org.za). The Early Career Hydrogeological Network (ECHN) is very active within IAH and an excellent initiative. Jared van Rooyen will present this at the GWD Conference. We will also be having an exhibition booth at the GWD Conference in collaboration with the Groundwater Division, so lease do visit. The next IAH Congress is to be held in South Korea and I urge you to attend for many reasons. Till next time and all the best.